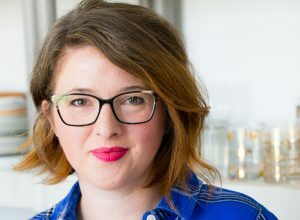 No, you are not experiencing deja vu, I am definitely giving you another recipe for Matzo Bark. 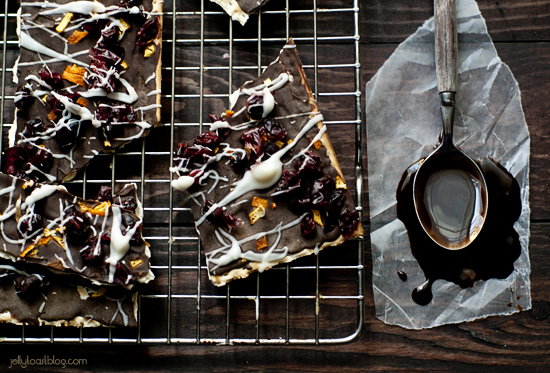 This time, it’s Matzo Bark with Dark Chocolate, Orange and Cranberry. Yes, I can’t help it, this stuff is addictive and a quirky, unexpected way to round out the Christmas cookie tray. Your cookie eaters won’t be disappointed. I have to say that I love me some orange and chocolate. And orange and cranberry. Really, any dessert with any or all of those flavors deserves some attention. And attention it will get. From me, at least. On a side note – when making this bark, I cut the junk out of my finger. That being said, I can’t warn you enough to use caution with the knifery. You will be momentarily drugged with the smell of orange and chocolate, but keep your wits about you. Eating this with a bandage on your finger is not as fun as eating it without. Just saying. Chop with care. Eat with abandon. Place bittersweet chocolate chips in a microwave safe bowl and microwave on high for 30 seconds. Stir and microwave for an additional 15 seconds. Repeat the process until the chocolate is melted. Lay matzo crackers out on a large sheet of wax paper. Spoon the melted chocolate on top of each cracker and spread evenly to coat. 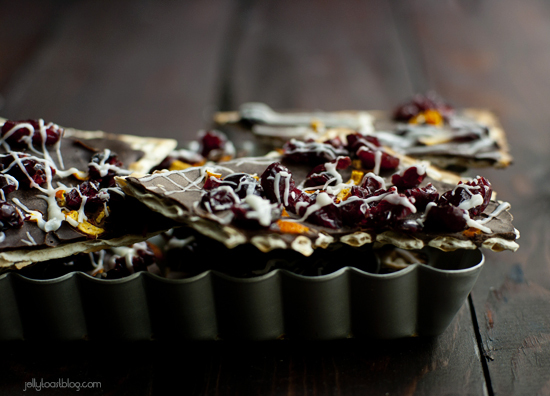 Sprinkle the coated crackers evenly with cranberries and orange peel. Melt candy coating according to the package directions. Dip a fork into the melted candy coating and drizzle over the coated crackers. Refrigerate crackers until chocolate is firm. Break the bark into pieces. Eat and repeat. Bark can be stored in the refrigerator for up to one week. 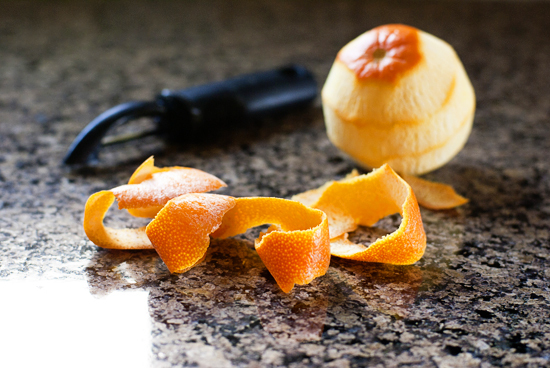 I used a vegetable peeler to remove all of the orange part of the orange peel. Then a knife to finely mince the peel. I love how dark and gorgeous these shots are! Thanks Loretta! I feel like I’m caught between going very light and bright with my photos lately and then very dark and moody, lol. I can’t decide which I like better, and I truly think it depends on the dish and my mood. I love this recipe! I make it all the time with Ritz crackers and I call it Christmas Crack! Awesome! My sister-in-law makes another similar item that involves melted butter, sugar and chocolate on town house crackers and then you put it in the freezer. 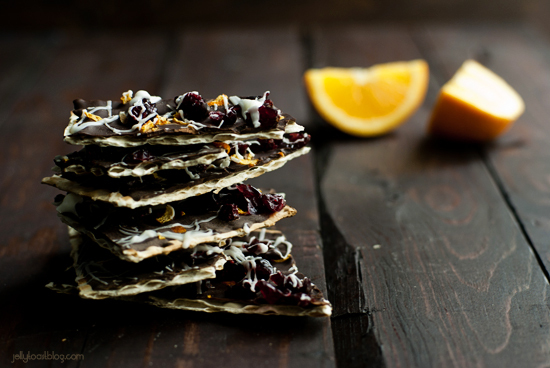 I just love the idea of using crackers as a base for desserts. Thanks for sharing and stopping by to say hi!